The three main characters, StingRay, Lumphy, and Plastic, are toys who live in a house with the Little Girl and her parents. When the family is asleep or away, StingRay, Lumphy, and Plastic roam the house, play with the other toys in the girl’s bedroom, and visit TukTuk the towel in the bathroom. And, they have adventures – with the Little Girl, and just with each other. I wasn’t sure how I would feel about talking toys, and a story told from toys’ point of view. But, this works – in a fun way. The toys are childlike in their limited knowledge of the world and their curiosity. They also have very human character flaws. Each is likeable – but Lumphy is my favorite. Lumphy gets into a sticky mess while on a picnic with the Little Girl and her father. It involves lots of peanut butter on buffalo fur. The Little Girl says Lumphy needs to be washed. Lumphy is afraid of the washing machine – it is in the basement which StingRay has described in a frightening way, and TukTuk the towel has said that the machine spins you around in a dizzying way – so he crawls into the closet and hides in a shoe. Many days later, he hears the Little Girl crying and creeps out to see why. When he discovers she misses him and thinks he’s gone forever, he thinks about the girl and about the washing machine…and the girl….and the washing machine. He decides on the girl, and lets himself be found even though it means facing the washing machine. Lumphy discovers that the washing machine is called Frank, that he is friendly and lonely, and that he can sing. When Frank starts the wash cycle, Lumphy feels frightened and motion sick. Franks explains that he has to continue the wash cycle, and suggests Lumphy think of it as a dance, and sings to Lumphy. Dance that buffalo shuffle with me! Lumphy sings along, and ends up enjoying his time with Frank the washing machine. Later, he thinks of ways to get himself sticky again so he can visit Frank more often. This is a chapter book (6 chapters) with black and white illustrations here and there. It is best for younger chapter book readers, and works well as a read aloud, too. 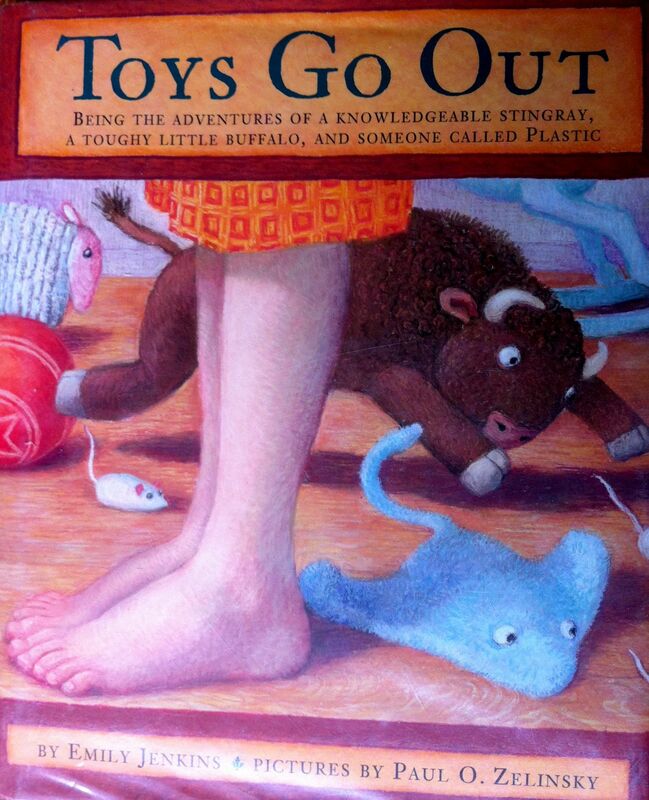 There are two other books in this series: Toy Dance Party, and Toys Come Home. Sounds like a very imaginative book. It is…..but, I know my children have imagined their stuffed animals doing things on their own, and having adventures, too. Thanks for stopping by from the Kid Lit Blog Hop! This book sounds like a fun read as well as Toy Dance Party, and Toys Come Home. We’ve read all three books – they are good as read-alouds or for young chapter book readers. Thanks for stopping by Bookworm Bear! This book sounds wonderful! I love the washing machine scene–this sounds like great fun. Can’t wait to read it. I hope you like the book. I think the washing machine scene is one of my favorite parts of the story. Thanks for stopping by Bookworm Bear! How funny that (a) the girl has a stingray as one of her favourite toys, and (b) he is the stingray of Doom-related Sooth-saying! This sounds like a really cool story. Oh, and I am admiring the lovely bookshelf in your header picture! We’ve enjoyed the story and the quirky characters. I’m glad you like the header bookshelf picture – it was hard to choose which row of books to use. 🙂 Thanks for stopping by Bookworm Bear! Since I don’t sing all that often, singing about getting back into bed (or anything else) does seem to help – it shifts things to laughter and makes it easier for my children to do what I’m asking them to do. You could call me Frank, too. 🙂 Thanks for stopping by, and for hosting the Kid Lit Blog Hop!